This is an old post, but I thought it would be fun to return down "memory lane." I won't be attending the conference this year, but look forward to going to Dallas in 2012. 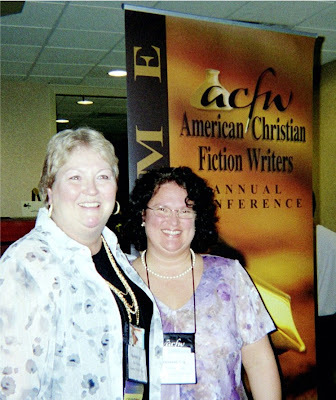 I attended my first ACFW conference in 2002 and have been fortunate to go to all but one since then. I thought it might be fun to share the highlights from each year and also give you a glimpse of what my goals were—and how they’ve changed through the years. 2002 (Kansas City) – My first big conference. I looked forward to meeting fellow critique partners pictured above. Carefully planned every aspect of my conference experience, down to what I would wear each day, what classes I would attend, who I would sit with at each meal and how many hours I might allow for sleep. Planned to pitch Sending You a Valentine. Printed my own business cards, prepared a one sheets and had my first chapters—should anyone want them. Drove to conference with Rhonda Gibson, Jeanie Cash and Jean Kincade. At the conference, was in awe to see Deborah Raney and Brandilyn Collins at the hotel registration desk. They looked larger than life to me. Met fellow Kansan, Kim Sawyer at the meet and greet and discovered she felt just as scared and out of place as I. Tossed and turned the first night with hardly any sleep. The second night I slept like a baby but the next day cried my eyes out, missing my family. Asked fellow attendees to sign ACRW t-shirt with colored markers. Managed to get through my first editor meeting with a compliment that I was one of his most relaxed meetings yet. In reality, I was scared to death. Took pictures of my plate at the banquet meal as I’d never seen such a beautiful display of food! Had a paid critique from Pamela Griffin, and she had nice comments about my writing. Met Karen Kingsbury. While gone, my oldest daughter went on her first date. 2004 ( Denver) –Went to conference on scholarship. Again, every detail planned. Upon registering at the hotel, gave hugs to Lena Nelson Dooley, Rhonda Gibson and others. Still in awe of the big authors. Roomed with Beth Goddard and stayed up giggling. Helped as a meal greeter and class monitor for Kathleen Morgan. Had a paid critique with Steve Laube and he ripped my newest project, Quarterback Cowboy to shreds. Pitched a rework of Sending You a Valentine to editors & received no more enthusiasm than before. Had a mentor meeting with Brandilyn Collins and she warned me to enjoy the journey. Met Francine Rivers. Cried my eyes out Friday missing family. Mentored two new authors. Had friends sign my canvas bag with colored markers. 2005 (Nashville) – Third time’s the charm. I again reworked Sending You a Valentine, sure this would be the year someone would pick it up. Had synopsis and first chapters of a reworked Quarterback Cowboy to pitch. Went to conference on a special Steeple Hill scholarship and had meetings with 4 agents and 4 editors. Ordered business cards from Vista Print and had my one-sheets. First night woke to fire alarms going off and scared roommates Beth Goddard and Lisa Harris, and me to death. Met Karen Ball and listened to tales about fishbowls and southern accents. At my final agent meeting, met Beth Jusino and had a request to see more. Mentored two new authors. First year to fly to conference. 2006 (Dallas) - Went to Dallas as an agented author with nothing to pitch because my series proposal for Seasons of the Tallgrass was currently being shopped to publishers. Sat back and enjoyed this conference without stress of pitching. Went to workshops and visited with other authors. 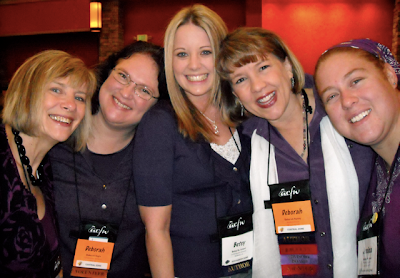 Again roomed with Beth Goddard on ACFW scholarship. Helped as meal greeter and at registration. Met Liz Curtis Higgs. Enjoyed time with mentoring friends, Carole Brown and Christina Miller. 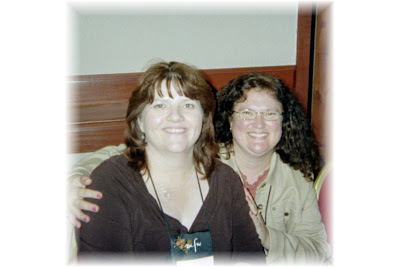 2007 (Dallas) - Went to conference as unagented author after my first agent let me go, unable to sell my series. Again on scholarship. Drove and roomed with friend, Elizabeth Curtis. Helped with registration and as meal greeter. Humbly begged agents to give me a chance. After one horrible agent meeting, went directly to prayer room sobbing in tears and was comforted by now best-selling author Kim Sawyer. Deborah Raney and Tamera Alexander also prayed with me. Couldn’t sleep that night and got up early to sit in prayer room. Had encouraging meeting with agent Steve Laube about new project I had in mind. Met James Scott Bell. Sat with Bethany house authors at awards banquet and felt so blessed. Brandilyn Collins prayed over me before going home. 2008 (Minneapolis) - Attended as agented author and newly contracted author for Zondervan. Rode to conference with Susan Mires. Helped with registration. Helped Beth Goddard when she had a broken ankle. Attended workshops and enjoyed visiting with good friends. Became better acquainted with agent, Rachelle Gardner. Went to dinner with Zondervan authors on Friday night and felt so out of my league. Went to book signing at Mall of America, dreaming what it would be like next year when I would sign my new book at the conference. Met Angela Hunt. 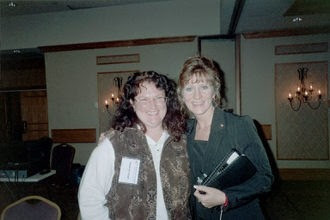 2009 (Denver) – Drove to conference with good friend and first time attendee, Julane Hiebert and had book signing in Hays, KS along the way. Attended workshops and early bird with Donald Maass. Visited with good friends and had Friday evening dinner with Zondervan authors. Sat with agent and fellow WordServe clients at banquet. Got homesick on Friday and called family. Signed books at my first ACFW author book signing. Roomed with Beth Goddard and giggled into the night. Met Debbie Macomber. In looking back through the years, you can see how my agenda has changed. I’m no longer stressed about what I’ll wear or who I’ll meet or what I’ll pitch to the editors. My prefered mode of transportation is still by car. I continue to get homesick for family about midway through the conference. With each new year, I now look forward to meeting new friends and visiting old ones, of furthering my knowledge of the craft and of helping new conference attendees feel comfortable and have a good experience. I cannot imagine a better organization or writing conference than ACFW.